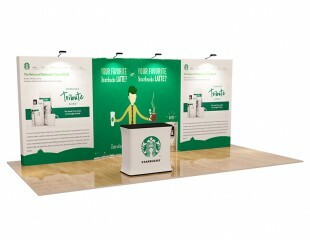 Pop Up Displays can be set up in a couple of minutes, and assembly requires no tools or connecting of parts. Simply pop up the aluminium framework and attach the high-quality sublimation printed fabric wrap. 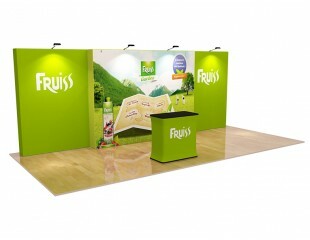 Pop Up Displays have been popular at exhibitions and trade show for years, and with a combination of a highly professional look and simple one person setup, it's easy to see why. 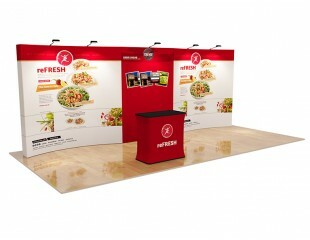 Stretch Fabric Display systems offer some huge benefits over conventional Pop Up Display backdrops. They are lighter weight and easier to transport, and there's little risk of damaging the material during assembly or take-down. We also use exceptionally high-quality sublimation printed material for the most vibrant print possible, and all prices include unlimited full-colour printing.